Early in October I photographed the fabulous wedding of Francis and Hannah at St James Church in Hemingford Grey followed by a tea party style reception at the Belfry Hotel in Cambourne. I have always been intrigued by the church in Hemingford Grey and a little research answered my question about its unusual spire (or lack thereof!). In the hurricane of 1741 the spire was blown into the river and never replaced. I can only wonder what the residents of the Hemingford’s must have though all those centuries ago – they must have thought the world was ending. It unusual feature can be seen for miles along the river and its situation is one of the loveliest along the River Ouse. Hannah arrived resplendent in a froth of wedding dress and smiles and was ably assisted out of the car by her father. This was lovely to see as quite often believe it or not, the father of the bride often ends up missing this critical moment and leaves it to the chauffeur and bridesmaids! 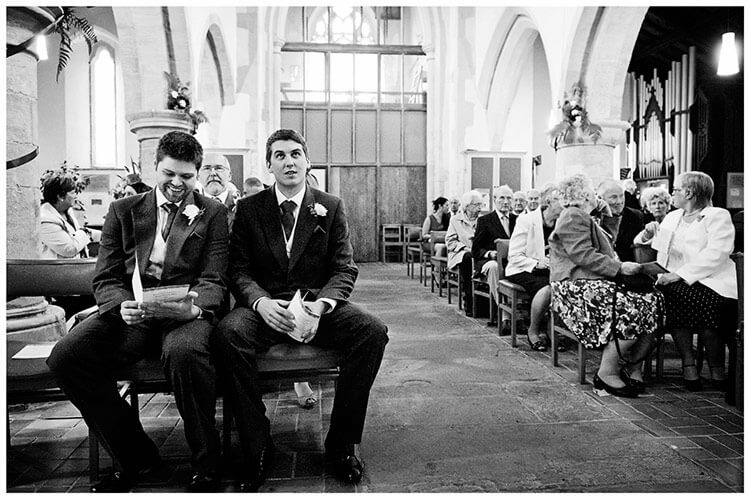 The small hiccough during the ceremony of the vicar forgetting to ask who was giving the bride away only served to increase smiles and laughter (a quick ‘reversal’ of the ceremony remedied the problem!) and Hannah certainly didn’t seem to stop smiling and laughing for the remainder of the day; an absolute joy to witness and capture – no direction needed, which suits my style as a Documentary Wedding Photographer. Young and clearly very much in love with one another their joy clearly spread amongst their guests albeit with the exception of one small guest who refused despite Hannah’s best efforts to kiss the new bride! An afternoon tea brought everyone together to celebrate and also gave me the opportunity afterwards to spend some time with Francis and Hannah to capture some relaxed images in the grounds of the Belfry Hotel that are perhaps less documentary in style but nonetheless romantic and I think clearly show how happy they are together. Are you planning a Belfry Hotel Wedding? If you’re planning a wedding at The Belfry Hotel in Cambourne and like this style of relaxed wedding photography why not give me a call 0370 626 5200, drop me an email, or use the Contact Form to get in touch, I’d love to hear your wedding day.